Haverford School lacrosse coach John Nostrant will step down after this season. In 28 years, he has won 14 Inter-Ac League titles and two state championships. 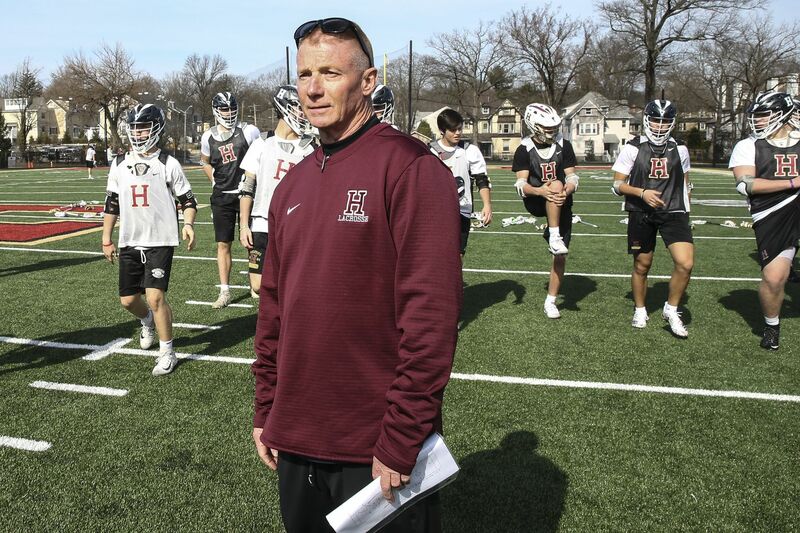 After 28 years, 15 Inter-Ac League titles and two state championships, John Nostrant is moving on as head coach of the Haverford School boys’ lacrosse team. The 55-year-old Haverford resident began working as a teacher at Haverford in 1991. He said recently that his departure at the end of the 2019 season is the right move. “I felt that it was just time to go. It had run its course,” Nostrant said. What has kept Nostrant at Haverford for so many years is the bond he has formed with the players and their families. In August, the Haverford School announced that former Haverford College and Widener coach Brendon Dawson would be Nostrant’s successor. Nostrant talks with his players at practice. Nostrant was introduced to lacrosse when he was in the eighth grade in his hometown of Baldwinsville, N.Y. After he became frustrated with baseball, he gave lacrosse a shot and was hooked. Nostrant later played lacrosse for Washington College. He was a three-time All-American midfielder and inducted into the school’s Hall of Fame in 2002. After college, Nostrant returned to his alma mater as an assistant lacrosse coach and then became a two-time All-Pro player for the Wings and the Baltimore Thunder of the National Lacrosse League. After five years of teaching and coaching, Nostrant was offered a position with the Haverford School, and he’s been there ever since. Nostrant’s passion for lacrosse has been passed down to his three children, all of whom followed in his footsteps and now are a reason for his departure. Nostrant poses with his 2019 Haverford team. Nostrant’s influence as a coach has expanded past his family and, according to senior Peter Garno, is unlike any experience Garno has had with a coach before. Playing for Nostrant during the coach’s final season with the school is something Garno holds close to his heart. The rest of Nostrant’s final season is looking bright, with the team headed to the Geico National Showcase on April 27-28 in South Huntington, N.Y., to face off against five of the nation’s top lacrosse teams. And although Nostrant’s time with Haverford will soon be over, his coaching career has no end in sight. Nostrant said he plans to explore his options for new coaching positions while running the premier lacrosse league he helped establish, the Mesa Lacrosse Club.